We're in the first month of 2013 and the trends in retail t brought on by advances in technology are becoming even more apparent. Smartphones have taken over how we interact on our mobile devices. We've gone from small starts such as email subscriptions to accessing full catalogs from our favorite stores. Shopping can now be done anywhere with Internet connection and sufficient battery life present. An increasingly popular new retail trend is shoppable media. This interactive marketing approach allows consumers to engage with retail media. Target is one of these stores making headway in this arena. In its shoppable series "Falling For You"--which features Kristen Bell, Nia Long, and Zachary Able--shoppers are able to click on items that they like featured in the episode and go on to purchase it from there. With technology making it possible to incorporate interactive features on our computer and mobile device screens, it makes sense that the consumer experience will continue to evolve in pleasantly surprising ways. While we may never adopt Smell-O-Vision into our homes, the ability to simply watch, click and buy is something that most consumers can take advantage of. While retailers want to make it easier for consumers to buy from the convenience of their homes, or anywhere for that matter, they still want to see their brick-and-mortar shops bustling with shoppers. So to in order to establish a middle ground, many retailers are incorporating the same kind of technological experience into their shops. Take Walmart, for example, which is in the process of testing out a "Scan & Go" iPhone app. This app lets shoppers scan their items using their phones and pay for them at a self-checkout counter. In any service experience, speed and convenience are the main keys to great customer service. With this app, long lines and crowded aisles would be eliminated allowing shoppers to get in and out quicker. Last year, Macy's added interactive kiosks to their stores to enhance the shopping experience by making it easier for shoppers to find what they want all in one place. JC Penney is now among those following suit with their own in-store kiosks which feature maps and gives shoppers the ability to purchase items not found in-store. 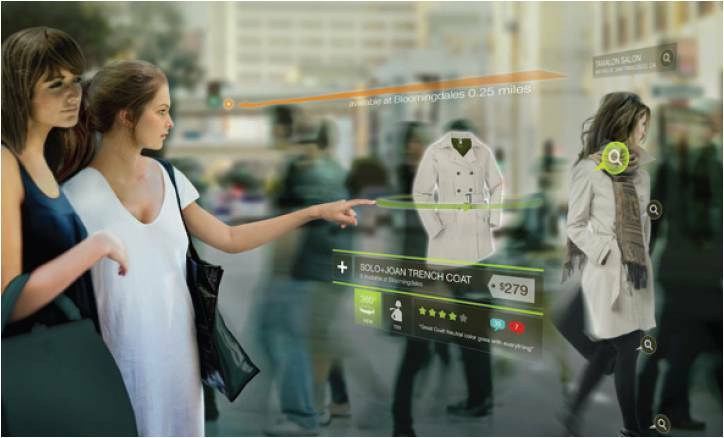 Futuristic shopping innovations have already made improvements in the way we shop now. Major retail giants are taking strides toward more shopper convenience with technology. From putting the benefits of self-checkout into your very hand to in-store kiosks that serve as high-tech customer service reps, shoppers are getting more of their needs met. Consumers crave convenience which is what online shopping has become a symbol of. However, 90 percent of sales are still done in the physical stores. Online shopping provides additional convenience but is by no means a substitute for what brick-and-mortar shops have to offer. Companies are finding new technological ways to put their customers first and its speaking volumes for their reputations and their sales.